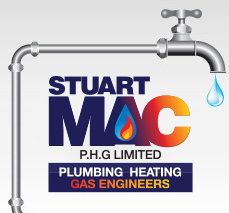 STUART MAC PHG provides a complete service to ensure that you get the best from your radiators from repairing leaks to plumbing in additional radiators were here to meet your needs. Has your radiator started to leak either from the radiator itself or more commonly the flow or return connections the give us a call we can in most cases fix them in a short period of time. Are your radiators not providing the correct level of heat or are patchy in areas across the radiator this could be either air blockages or a build up of sludge in the system which can be cured either by balancing the system or power flushing to ensure the system is efficient and providing the correct level of heat. Are your radiators fitted with thermostatic valves? If not then we can supply and install these for you providing you will a more balanced heat around your home, we can also replace broken TRV’s. You may already have TRY’s fitted but still don’t seem to get the correct heat level this is sometimes caused because a TRV is fitted in the same room as the thermostat if so turn it down to level 3 and leave it if this does not work please give us a call. Are your radiators getting old, need replacing? Like for like replacement is not always the answer, especially if your heating system or house has changed since it was first installed. We can recommend and supply or just install the correct size replacement radiators for your system. Built a conservatory or knocked through two rooms into one or just want to add radiators we can advise on the correct size and type or even provide advise to avoid the additional cost. We can recommend, supply and /or just install your additional radiators. Do you want to add a towel rail to your heating system currently powering it with an electric thermostat but it’s costing the earth!! We can recommend supply and or just install your heated towel rails. Are your radiators in the wrong place to suit your room layout it, we can advise on the advantages and disadvantages of moving your radiator and move them for you. Do you feel that the radiators you have are not heating your room we can visit your home and ensure that your radiators are the correct size and type for your room offer advice to ensure that your radiators are providing efficient heat for you. Please note we do charge for this service should you need and have radiators replaced then 50% of the consultation fee is refundable. Are you looking for something special make the difference with designer a radiator. We can either install your designer radiator or recommend supply and install for you.